When a country wins World’s Leading Culinary Destination you take notice. When Peru won World’s Leading Culinary Destination four years in a row from 2012 through 2015, you know it’s definitely time to visit. 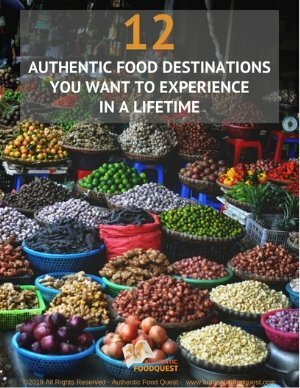 While the focus is rightly so on the food and gastronomy, we want to put a spotlight here on 10 unique Peruvian drinks we have discovered on our quest for authentic food in Peru. The Pisco Sour is considered the national drink of Peru and it even has its own National Holiday. National Pisco Sour Day is celebrated on the first Saturday in February. Pisco Sour is made of Peruvian Pisco as the base liquor with lime juice, syrup, ice, egg white, and Angostura bitters. To make a good Pisco, it all comes down to the right proportion and the thorough mix. It is a strong drink though nice and refreshing. This is one of the Peruvian drinks you cannot miss while in Peru! If you want to know more about Pisco and how to make Pisco Sour check our post here. The first time we heard of Chilcano was through our gastronomy critic and friend Cecilia Portella Morote. 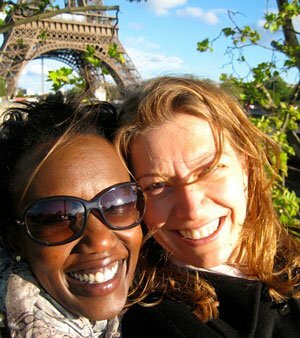 Cecilia encouraged us to try it out after we had shared a couple of Pisco Sours together. 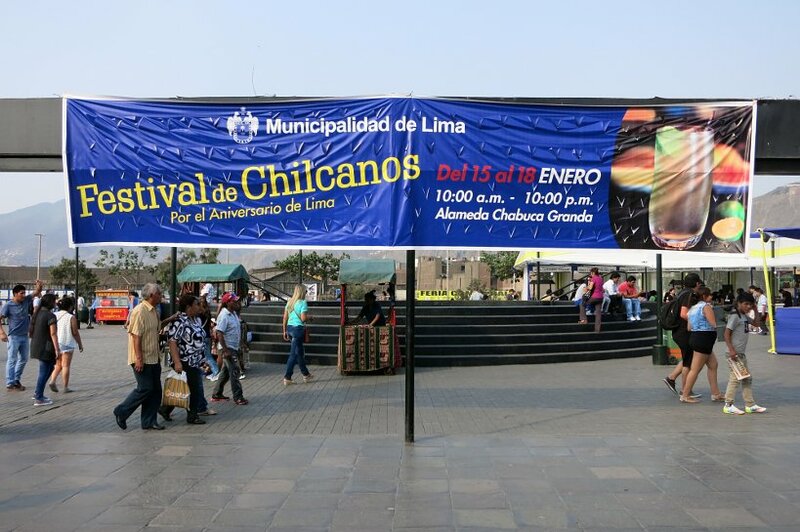 We were lucky because while we were in Lima the Semana del Chilcano (Chilcano Festival) was taking place. It takes place in mid-January and runs for 11 consecutive days throughout Peru. Like the Pisco Sour, the Chilcano also uses Pisco as the base liquor, but it is not as strong. The classic Chilcano is made of Pisco with lime juice, ginger ale, ice and Angostura bitters. Other variations are made with all different kinds of exotic fruit juices like maracuya or lucuma. While the Chilcano may not be as popular as the Pisco Sour, it is a refreshing alternative and slightly lighter. If you happen to catch the Chilcano festival, you will be able to enjoy (in moderation) the many 2 for 1 Chilcano specials. 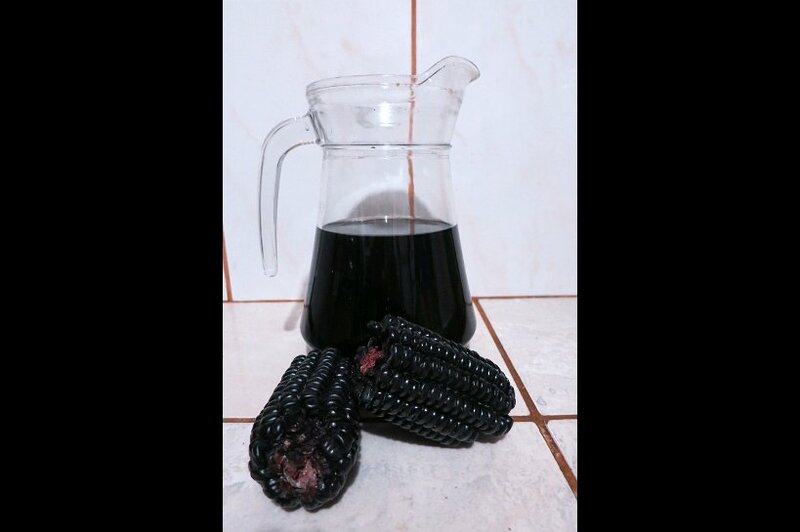 Chicha Morada is another one of the unique Peruvian drinks that is made from purple corn. Yes, Purple corn (Maiz Morada in Spanish). Purple corn is one of the unique corn varieties native to Peru. It has a long history and has been said to date back prior to the creation of the Inca Empire. Purple corn is is high in anthocyanins, which has many health benefits including reduced risk of heart disease, lower blood pressure and several other benefits which you may read about here. This non alcoholic beverage is made by boiling the purple corn with pineapple skin, cinnamon, cloves, and sugar. This was one of our favorite beverages to go along with our meals. We found it deliciously sweet and refreshing with the cinnamon adding a bright spark to the tongue. With its intriguing deep purple color, we could not resist all the goodness contained up in this unique Peruvian drink. Chicha de jora is a traditional drink from the Andes that comes from the Inca Empire time period. It is beer made out of Jora corn, a type of yellow corn from the Andes. The process to make Chicha de Jora is similar to the production of regular beer. We discovered Chicha de Jora at the Chinchero market, a small Andean village in the Sacred Valley, while having lunch. We were invited to have a Chicha de Jora to accompany our meal. We were served a large glass that we could barely hold with one hand! It has a thick foam on top of the glass. We learned later that it is tradition to spill the first portion of the beverage on the ground saying “Pachamama, santa tierra”as an offering to Mother Earth (Pachamama in Quechua). It is quite an interesting beverage that starts with slightly sweet taste and finishes with a strong sour taste, similar to a bitter apple cider. We barely finished it! Chicha de frutilla also known as Frutillada is a sweeter version of the Chicha de Jora. It is made with strawberries (frutilla) and sugar blended with the Chicha de Jora. It has a very weird pink color for a drink and tastes much sweeter than the Chicha de Jora. 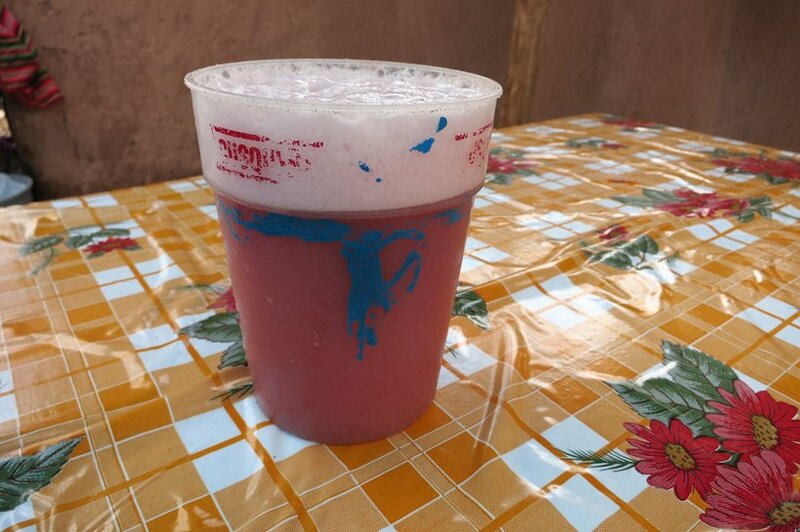 The strawberries cover the bitter taste and make it more drinkable than the Chicha de Jora. We had our first Frutillada at a traditional picanteria (a popular restaurant where they serve meat and traditional food) in Cusco. Again, we were served an enormous glass that we could only hold with two hands. 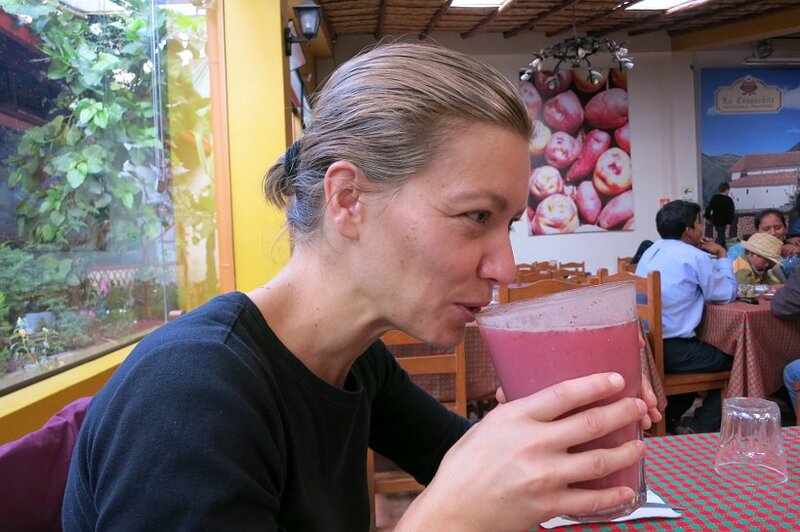 It took us some effort to finish the glass, though it was a nice drink to help eat the Chiriuchu, a Cusco local specialty. In countries like the U.S. it’s either Coca Cola or Pepsi. In Peru it is Inca Kola. 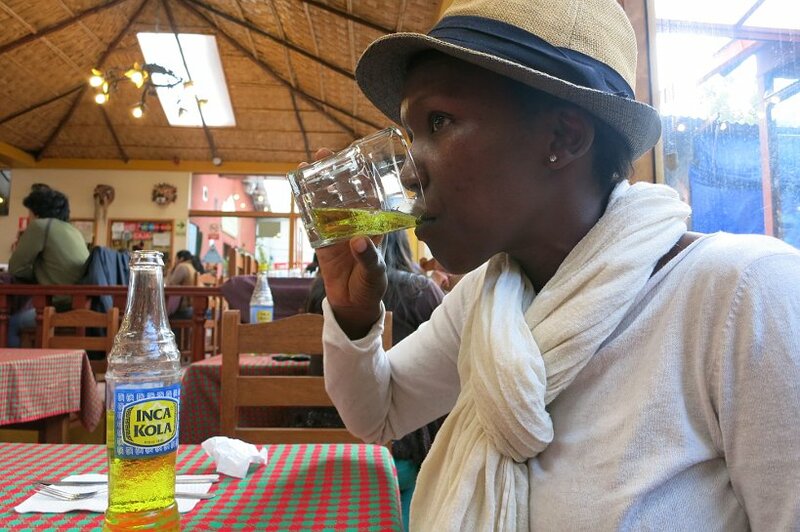 Inca Kola is a yellow fluorescent colored soda that is super sweet and tastes like bubble gum. The origins of Inca Kola go back to 1910 where a young English couple José Robinson Lindley and his wife Martha opened a small shop in Lima, where they sold homemade carbonated beverages. In 1935 Lima was celebrating 400 year since its founding and the Lindleys decided to produce a unique drink to commemorate the event and their new homeland. Marketed as the “Pride of Peru” you see this drink everywhere. It is the Peru’s preferred drink to complement Peruvian cuisine. Today, the Inca Kola Trademark is owned by Coca-Cola and you can find Inca Kola in many Peruvian restaurants in the U.S. as well as U.S. Latin themed stores. Although Pisco Sour is Peru’s national drink, beer is the most popular of the Peruvian drinks. Peru has three major beer brands Pilsen Callao, Cristal and Cusqueña. Pilsen Callao and Cristal are both lagers with little flavor in Claire’s opinion (yes, I am not a beer drinker). 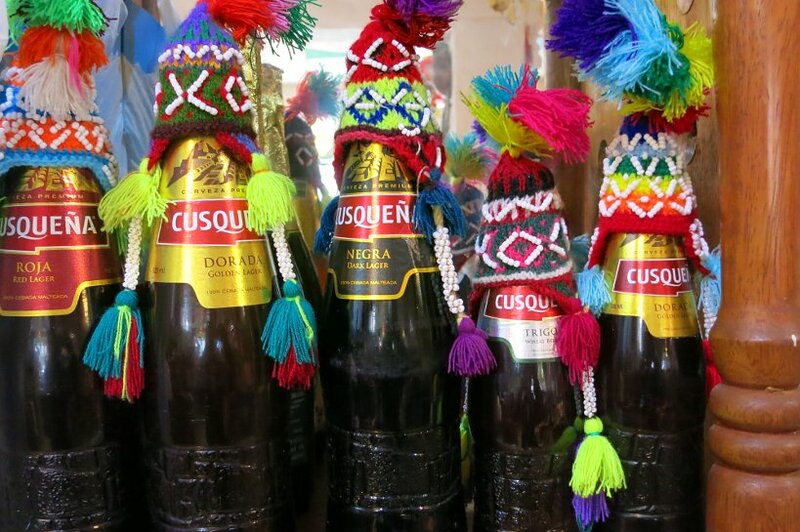 Cusqueña makes several variation of beers: golden lager, red lager, wheat beer, and dark lager, a beer for every taste! Cusqueña was by far Claire’s favorite. Other regional beers that exist but are not widely available are Arequipeña from Arequipa and Pilsen Trujillo from Trujillo. 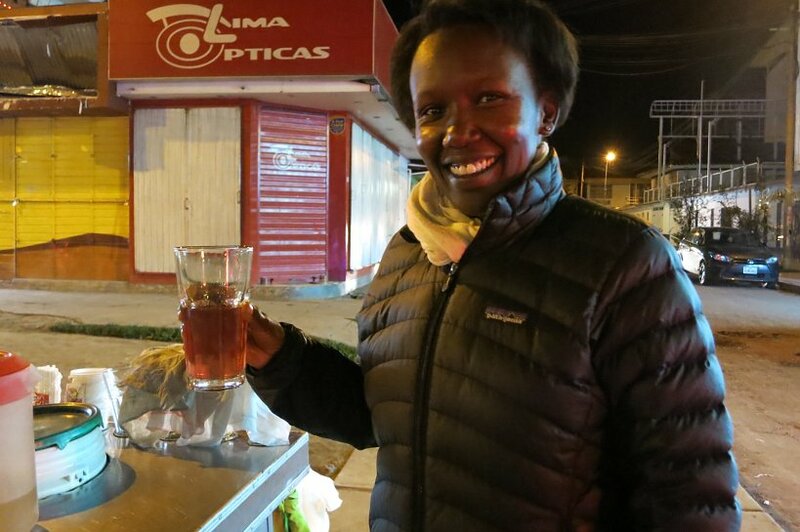 Famous in the Andes region, this unique Peruvian beverage is actually coca tea. It is an herbal tea made from the leaves of a coca plant. Mate de Coca is very popular and used to treat altitude sickness. We first had Mate de Coca in Cusco to help us adapt to the high altitude which is 3,400 meters (11,200 feet) above sea level. This tea is however controversial. According to Wikipedia, the leaves from the coca plant contain alkaloids, which when extracted chemically are the source for cocaine base. 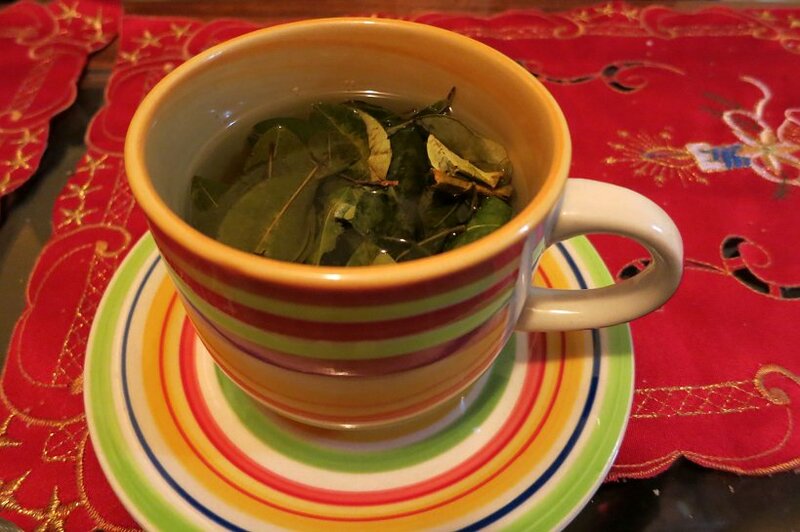 Though the amount in the coca alkaloids in the leaves is small, one cup of coca tea can cause a positive result on a drug test for cocaine. Needless to say coca tea is illegal in the U.S. though legal in Columbia, Peru, Bolivia, Argentina, Ecuador and Chile. Controversy aside, we both enjoyed this unique Peruvian drink. We found it easy to drink with a green tea taste. Mate de Coca kept us acclimatized as well as warm from the cold weather. Emoliente is one of the most unique Peruvian drinks we discovered and this discovery was made by chance. We were in Cusco and I was not feeling very well. 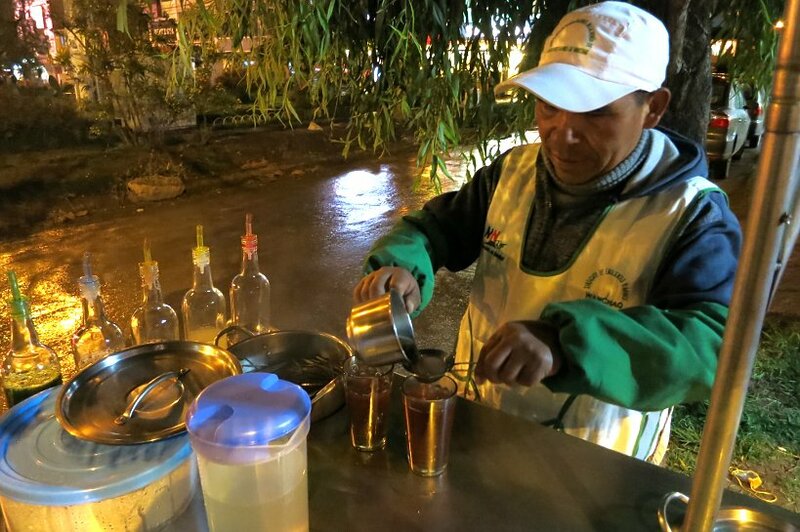 Our Airbnb host told us about a natural healing drink called Emoliente sold at street corners by vendors. We had seen these carts appear every evening and had been very curious about them. Emoliente is like an herbal tea that is very popular in the cold season. It is prepared with a base of herbs that usually includes barley, dried horse tail, flax seed, plantain leaf and alfalfa sprouts. On the vendors cart, you have two big covered bowls on the flat surface and several intriguing pharmaceutical like bottles on the side of the cart. The vendor told us that the 5-6 bottles on the sides are liquids with healing properties made from natural plants from the Andes mountains. In my case, the vendor put the main Emoliente in a glass and added in about 3 shots of natural liquids to help with stomach flu and indigestion. The first sip was a little bizarre. The drink was slimy, yet fruity. It tasted like there was a coating in the liquid. It was not disgusting just unlike anything we have ever tasted before. Imagine drinking a hot, fruity, slimy and semi-sparkly beverage. Nonetheless, the drink went down quite easily and I felt better taking something natural over prescription drugs. You can also drink Emoliente cold and you can buy Emoliente tea bags at the grocery stores. Peru is home to several kinds of different and amazing fruits. As a paradise of fruits, one of the best ways to enjoy the flavors is in fresh juices and smoothies. You will find fresh juice stands everywhere and most restaurants and cafes offering fresh juices on their menus. The choices of fruits are endless and include bananas, papayas, pineapples, guavas, maracuya (passion fruit) and many more. The juices are often sweetened with raw honey, algarrobina (carob extract) and fruit nectars. The fresh fruits, bright colors and fragrances are intoxicating making you remember and appreciate Earth’s goodness. 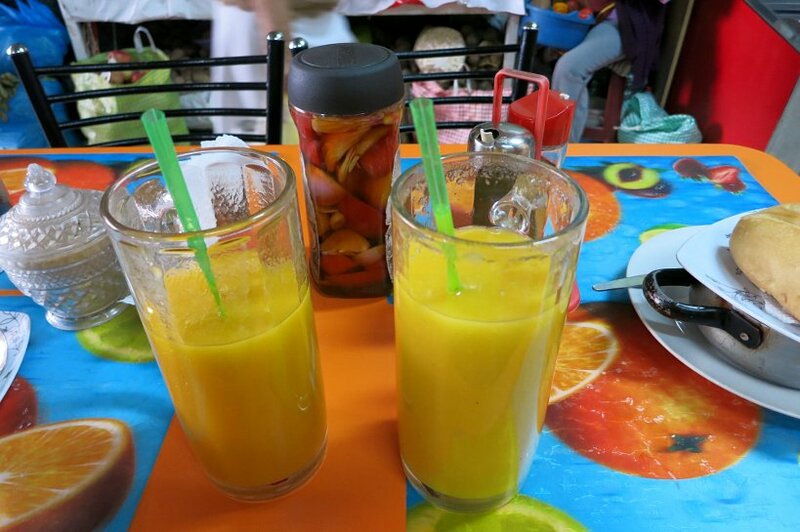 In the pictures below, we are appreciating two different types of fresh juices – one papaya and mango juice and the other, a mixed fruit juice. You can also find fruit juices from strange fruits from the Amazon jungle which you can read about here: 10 Strange Fruits from the Amazon Jungle You Will Not Believe. 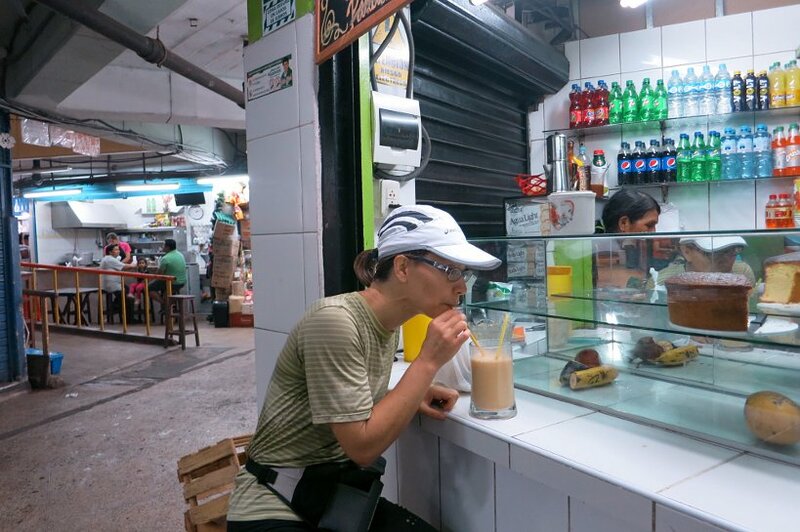 The hidden speciality and unique Peruvian juice is the “Jugo Especial.” This is a special juice that is a meal in itself. It is a mix of a little bit of everything including Cusqueña beer (optional) and an egg. We tried the juice but decided to skip the beer and egg option. It is an enjoyable deliciously thick juice and big enough to share as a meal. 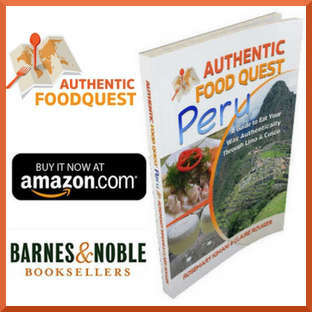 The journey through Peru is one that must take into consideration the unique Peruvian drinks that enhance the flavors of the traditional dishes. 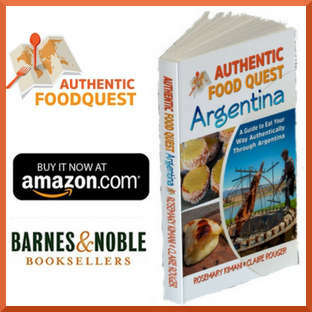 To get the most flavors and enjoyment out of the meals, you want to get the Peruvian drinks that are believed to enhance the flavors of the dishes. Inka Kola for example is the Peruvian drink of choice to accompany meals. It is believed to be the best complement for the unique and local dishes we highlighted earlier like Ceviche and Lomo Saltado. 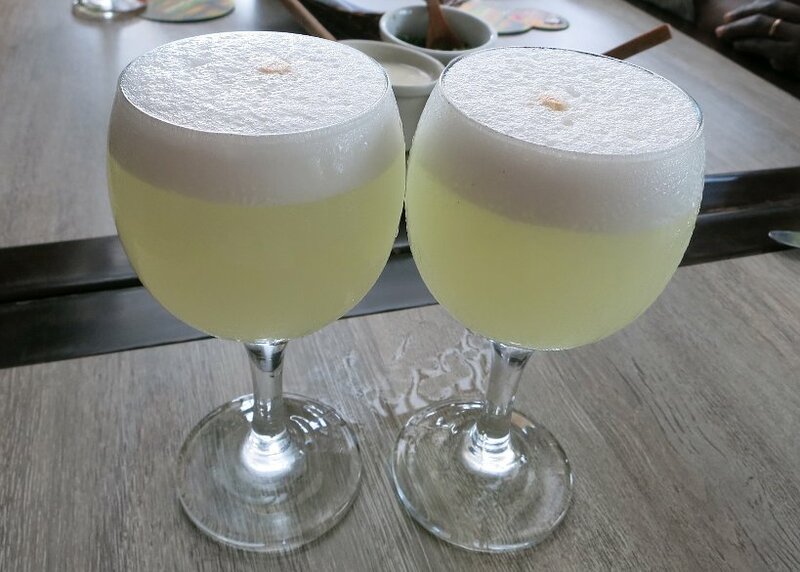 By highlighting these unique Peruvian drinks, our goal is to ensure that you know about Pisco Sour, the national drink, the best unique beverages to go with your meals and the various ways to enjoy natural and healthy fruits and plants. I didn’t spend that much time in Peru, but I came to love Pisco Sours, and, when we were high in the Andes, mate de coca. Also liked their beers. As for the chicha, I always managed to pour as much as possible on the ground as an offering to the Pachamama. Ha..ha…ha! That’s great. It seems like even though you didn’t spend much time in Peru, you managed to sample the unique beverages 🙂 Did you like the Chicha jorra? Peru has always been on my list but after seeing all these amazing drinks, I need to get there asap! I’d heard about Pisco Sours from a drinking travel show, Three Sheets, and always thought they looked so delicious! Who knew Peru had so many wonderful looking drinks? Also, the Inca Kola reminds me of Irn Bru from Scotland. Weird bright color and bubblegum taste! Dude! What is the picture at the top? Are those black corn husks? As a passionate herb-worshipping hippie, Emoliente caught my eye. I’d like to try that tea. Great post and delicious pictures as usual! I’ve had a few of there, but there are definitely a few I will need to try on my next visit!!! I’ll definitely have to try these when I find my way down to Peru. 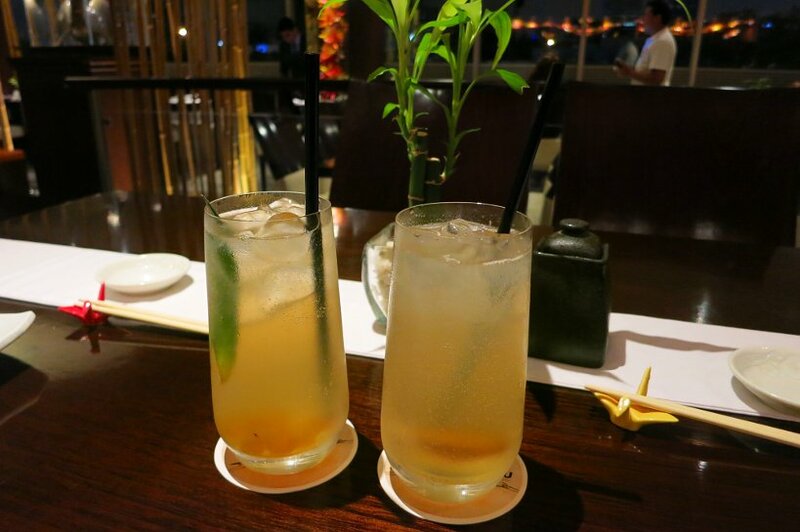 Most people have a “can’t miss food” article, but the drinks are just as important! Thanks Nofar…that’s exactly why we put this list of drinks together. The drinks do add to the entire experience:) Cheers! Ah! There’s a Peruvian market nearby where I live and they have Inca Cola there! I’ve never tried it, but a friend adores it. I’ll have to give it a try now. My brother’s going to Peru this May – I am so sending this article to him! Awesome.. Now that Inca Kola is owned by Coca Cola you may be able to find Inca Kola at a store (latin themed) near you. Try it out and let us know what you think of it. I was supposed to visit Peru last year but it didn’t work out. Hopefully this year! Sounds like I have a lot of new drinks to try 🙂 Cheers! Thanks Alyssa, I hope you make it to Peru this year. Yes, please try out all the drinks and let us know what you think. Cheers! I almost was going to go to Peru this May, but postponed the trip, but I hope to taste these drinks someday. Hope you get to make it to Peru soon Samantha. When you do, don’t forget to let us know what you think of the drinks. Cheers! How cool are the beer collars, very Peruvian. Many of these drinks I have not heard of. Intriguing. Thanks so much Paula! True the beer collars are indeed lots of fun. Glad you like the drinks:) Cheers! Thanks Krista, we also enjoyed learning and sampling all the different drinks 🙂 All unique and delicious in their own way. Thanks for your comments! Glad you enjoyed reading the post Lauren. 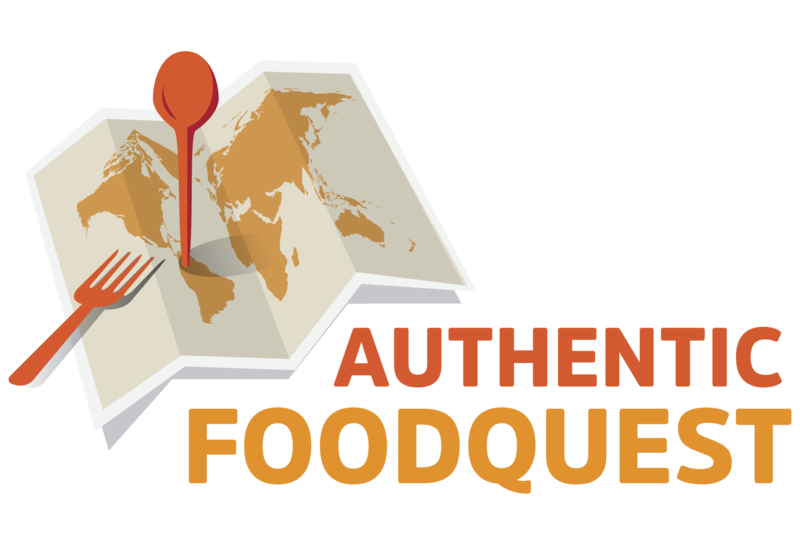 It’s true Peru is a foodie destination and a place with so many delicious products from the various regions. Cheers! I think Mate de Coca would be my favourite. Great post. Looking forward to trying these when I visit later in the year and picking up some of these drinks and food at local markets. Thats awesome. You will definitively enjoy your trip. 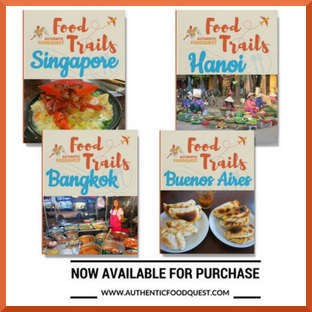 Make sure to check out the authentic dishes as well. Please let us know what you end up trying and enjoying! Glad you enjoyed reading the post and learning “new word.” The fruit juices are exceptional and so fresh. You would really enjoy them. Thanks for your comments. This makes me miss South America and Peru so much! I saw everyone drinking these purple jugs of drink and remembering wondering what it was. I had no idea until I asked someone! Then ended up having a Chicha Morada pisco sour in a pisco bar while in Cusco! Yummy. I could drink pisco sours every day! Ahhhh the memories. Enjoy! 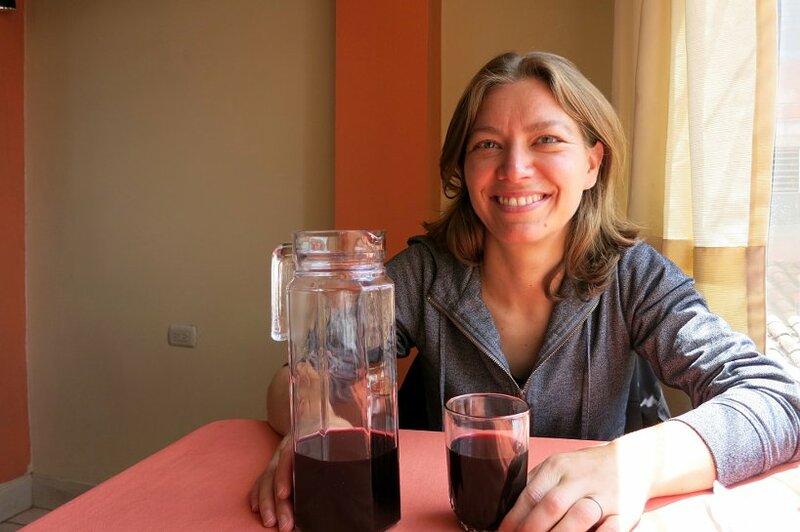 We so agree with you Amelia…the chicha morada ended up being one of our favorite easy drinks. We actually never tried the chicha morada pisco sour. I’m sure it must be very good. Yes, the pisco sours go down really easy 🙂 Cheers!